don’t miss this! for a limited time, madeleine bistro is selling coupons to get $20 worth of food for ten bucks! the restaurant is now open on saturday and sunday evenings as well as sunday for brunch…and if you haven’t tried it yet, now’s your chance! we’re approaching the holiday season, which means they’re starting to roll out thanksgiving menu specials! 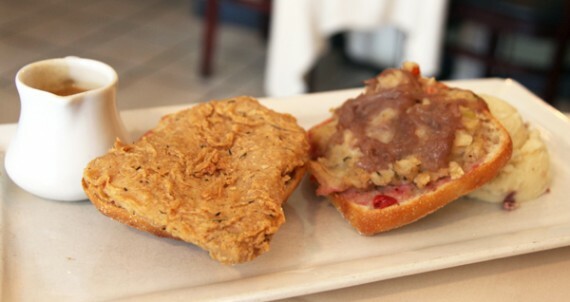 get your coupon here, and if you ever see the thanksgiving sandwich on the menu (herbed seitan, cranberry mayo, caramelized onions, gravy), ORDER IT! after years of sticking it out in the valley, madeleine bistro (our favorite restaurant ever) is finally planning to expand over the hill and open a cafe in los angeles next month. 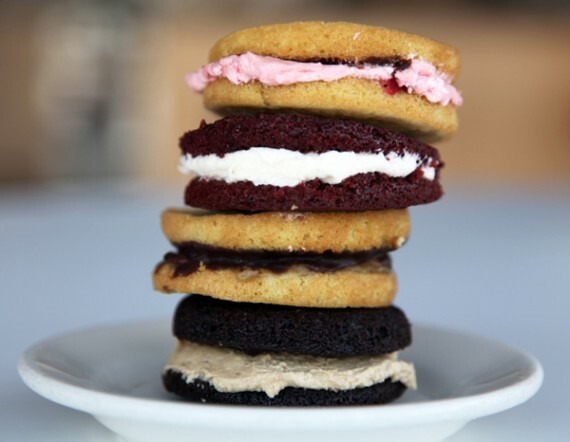 according to them, it’s gonna be an all vegan ice cream, pastry, and sandwich shop in westside LA featuring many of the menu items from madeleine bistro as well as an array of handcrafted desserts and eventually booze! but before they open, they need to do a bit of fundraising, and they’re offering some pretty sweet prizes (pun intended!) to people who help them meet their goal. they’re only accepting donations for ten days, so if you wanna get in on this, don’t stall. i’m usually pretty wary of online fundraising, but with this deal donors get something back in return—anything from free desserts to a party catered by chef dave. hmmmm…help a vegan restaurant open, and get a party catered by the country’s best vegan chef in the process? i may have to go out and make some actual friends so i can take advantage of this! seriously though, read all about the project here and pitch in whatever you can. los angeles will be a much better place when this cafe is open. as you probably know, the opening hours of madeleine bistro (what i consider to be the finest vegan restaurant on earth), have been pretty irregular. over the past year, they’ve shut down their weekday operation, gone on hiatus, switched around their weekend schedule, and everything in between. thankfully for us, it now appears as though they’ve settled into a normal routine of being open on saturday and sunday evenings for dinner, as well as brunch time on sunday from 10am – 3pm. we checked them out for brunch last sunday at around 11am, and had a meal of epic proportions. i am constantly amazed by the insane food this restaurant is able to create—it’s truly next level vegan stuff like i’ve never tasted. 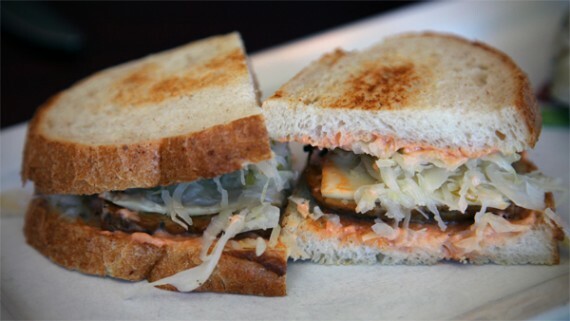 the first thing i noticed when i opened the menu was the addition of a tempeh reuben. being obsessed with the sandwich (you may remember the reuben wars of ’09! ), of course i had to order it. hands down, best potato salad i’ve ever eaten. 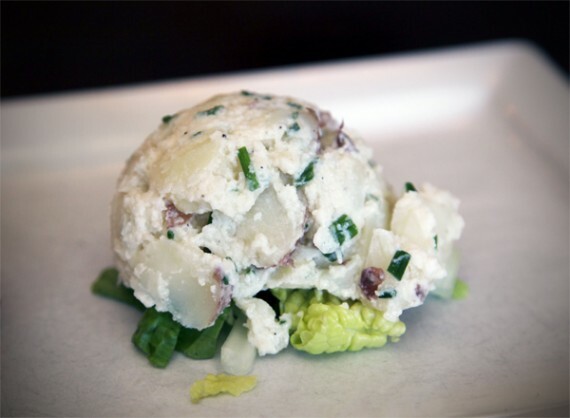 it consisted of red potatoes, chives, and celery in a light creamy sauce. my only complaint is that i wanted more. i finished it all off with some vegan creme brulee (pictured at the top–OMG!) 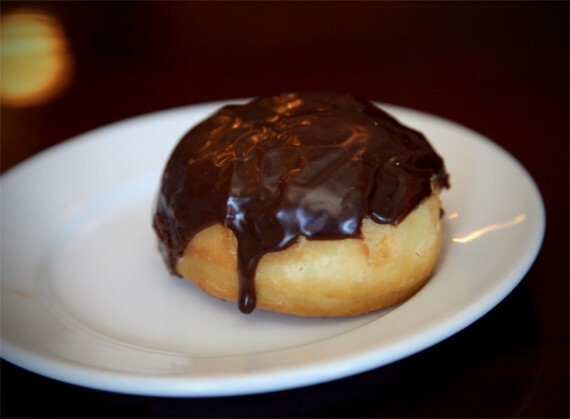 and a chocolate covered donut, another new (to me) addition to the menu. 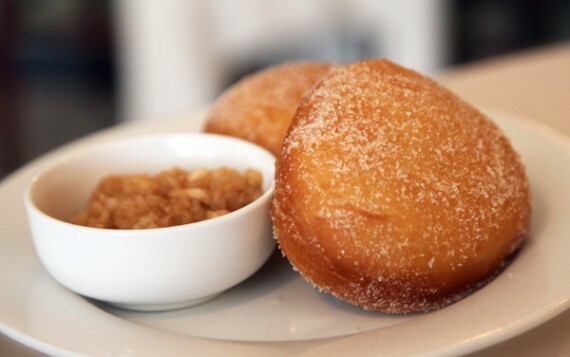 i have been a fan of madeleine bistro’s normal sugar coated donuts for years (they even made our bucket list! ), and i think i liked this one even more. 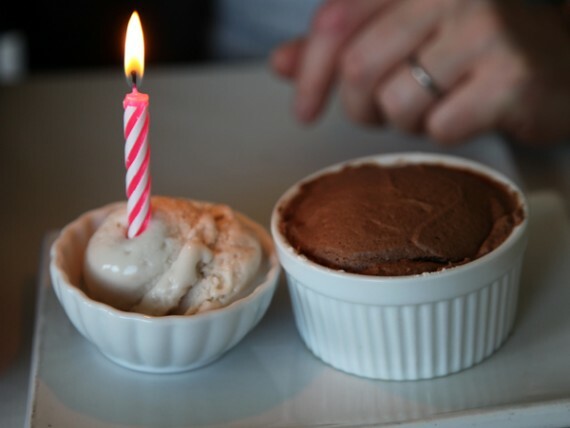 the cake was hot, fresh, and surprisingly light…while the chocolate was rich and melty. an extra special bistro box with clara’s cakes! vegan gobs! vegan whoopie pies! if you aren’t familiar with clara’s cakes, it’s an incredible los angeles-based bakery headed up by a 14 year old girl named clara. she may be young, but she bakes like a freakin’ pro, and her treats are something to behold. next week’s box will include a sweet from madeleine bistro as well as a bonus boston creme gob (or whoopie pie, whatever you wanna call them!) by clara. i have had these things and i promise you they are beyond yum—huge soft spongy cookies cushioning a generous blob of frosting…it’s what vegan dreams are made of. 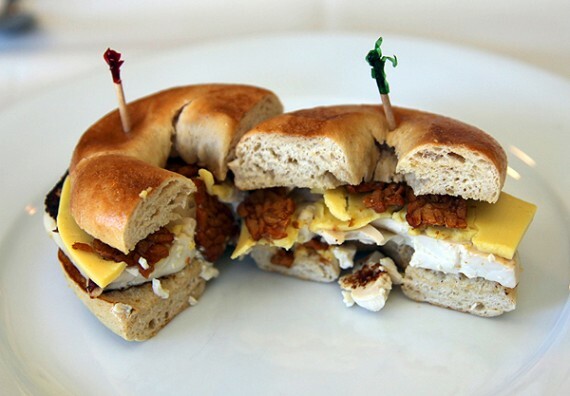 the bistro box itself is bringing its a-game next week as well. 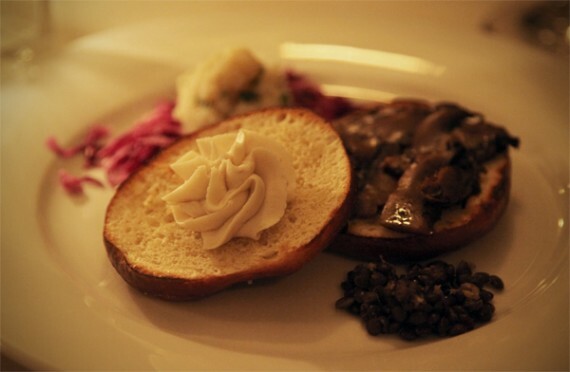 highlights include QG favorites like chicken fried seitan, lemon rosemary seitan, mac n cheese, a scramble sandwich, the legendary red beet tartare and MUCH more. 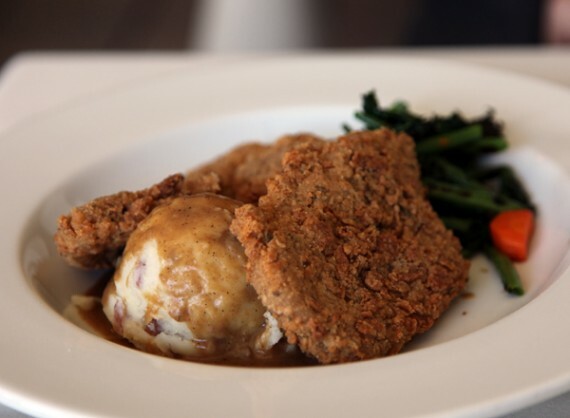 chicken fried seitan, mashed potatoes, pan gravy. all in next week's box. there’s never a dull moment in the madeleine bistro saga! last week we were mourning the closure of LA’s high brow vegan restaurant, and now just days later it appears as though they’re already planning an “encore weekend”. 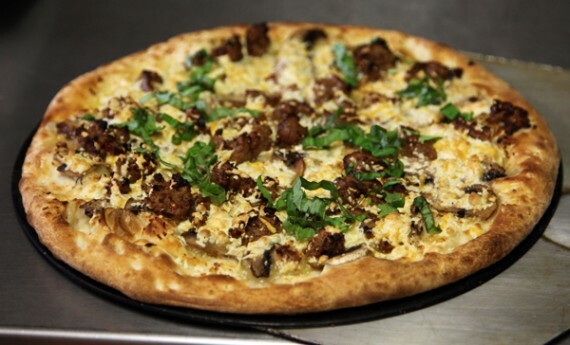 UPDATE 5/6/11: due to vegans going psycho, madeleine bistro has decided to move their closing day until may 22nd! take advantage, people. they are only open 3 days a week for 2 more weeks. make it count. well, this is quite distressing. madeleine bistro, our favorite vegan restaurant in all the land, took to their facebook page at 3am to announce their closure. say it ain’t so! 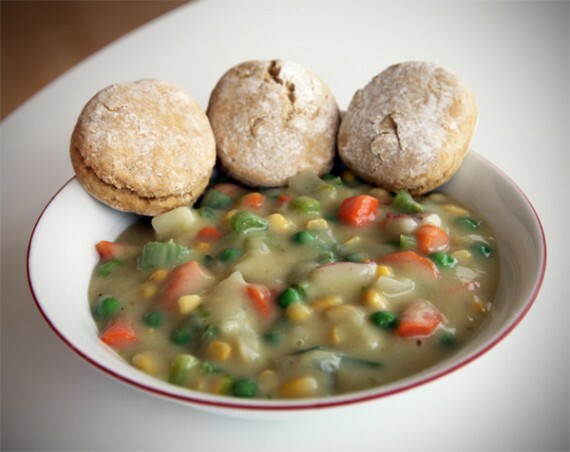 vegan easter sunday specials at madeleine bistro! plus, bistro box discounts! jesus would definitely come back from the dead to eat this food—the easter sunday menus at madeleine bistro are looking INSANE. 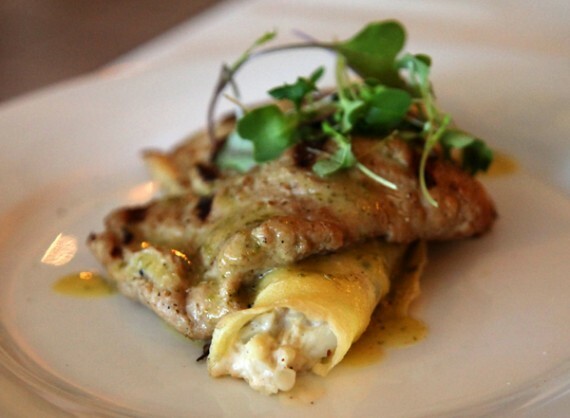 it’s no secret that our favorite restaurant in los angeles is madeleine bistro. 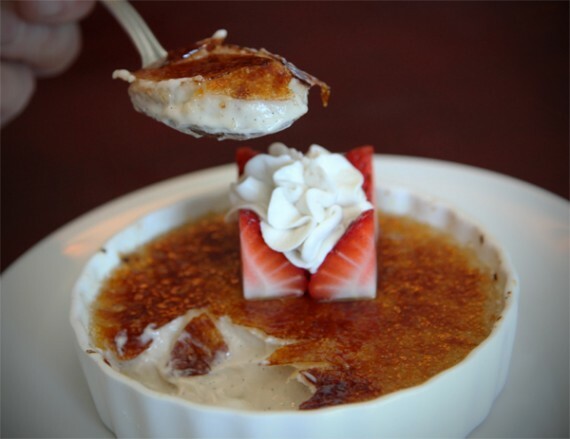 chef dave anderson continually creates what i consider to be the best cuisine known to man—from his signature gourmet tasting menus, to the deep fried comfort foods, to the epic and unbeatable sunday brunch. it’s all out of this world. 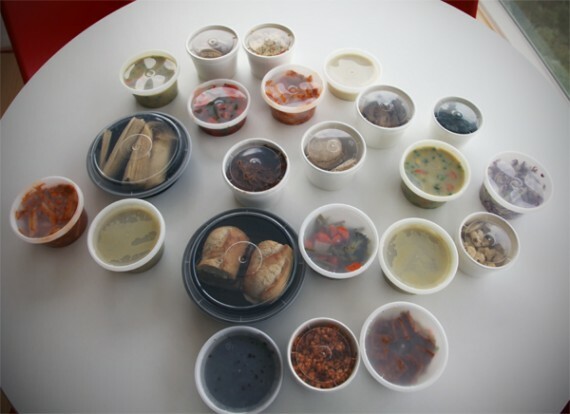 about ten months ago we blogged about the introduction of the bistro box, a service that brings a week’s worth of world famous vegan food to your door for a fixed price. i’m happy to report that almost a year later, the bistro box is still going strong and is even better than ever. we picked up a single (the smaller size) order on monday and have been absolutely thrilled with the quality and quantity of the selections. in fact, i’d highly recommend you get your order in for next week ASAP. officially the best meal of my life. thanks, madeleine bistro. 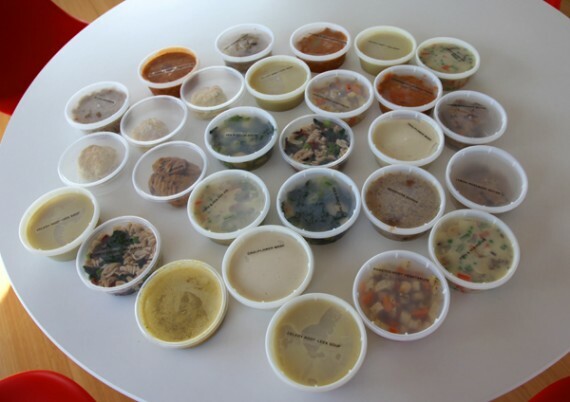 it’s no secret that i’ve eaten vegan food from all over the world. from paris to london, manhattan to fort lauderdale, san francisco to los angeles—i’ve sampled the fine restaurants that numerous different cities have to offer. and after stuffing my face full of just about every type of vegan cuisine, one establishment continues to stand out as my absolute favorite: madeleine bistro. order your madeleine bistro box for next week NOW. this one looks AMAZING. 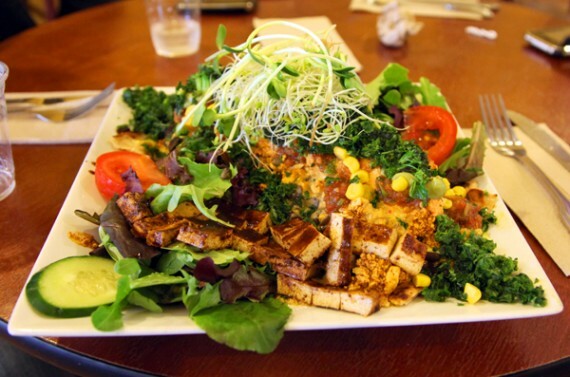 it should come as no surprise that the best vegan restaurant in los angeles, madeleine bistro, also has the best home delivery service: the bistro box. we have raved about the box before (trust me, it’s THAT good) but since then, madeleine bistro has made several changes to the service, and this week’s menu looks so amazing that i just had to share it with you guys. HUGE madeleine bistro update for this weekend! hey everyone: listen up! this is a HUGE madeleine bistro update for this weekend that you are gonna wanna know about. hot off the press we’ve got NEW hours, a NEW menu, and a NEW poll for you to fill out…but sorry, no new location yet, as we hinted at earlier. here’s what’s up with madeleine this weekend! 1.) NO BRUNCH THIS WEEKEND. sorry folks, but madeleine is renovating and improving their current brunch menu and need a few weeks off to get it ready to go. they will still be open for dinner though, so don’t miss out on that. 2.) NEW MENUS for this weekend! 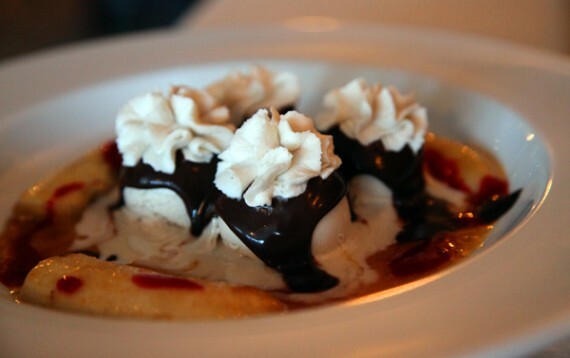 not only is there a brand new dessert on board (pictured above), but the tasting menu sounds incredible. 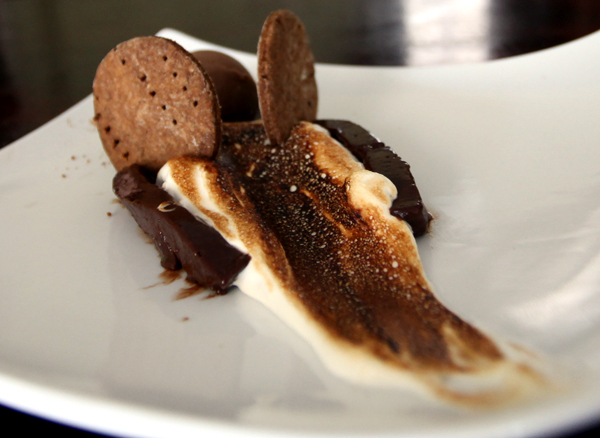 the new dessert is chef dave’s version of “deconstructed s’mores,” basically chocolate ganache, graham crackers, and vegan marshmallow fluff. i’ve tasted it, and i can say it’s one of the best vegan desserts i’ve ever had. EVER. the tasting menu this week sounds just as epic: a 5 course meal of bisque, “re-imagined” beet tartare, arborio-crusted mushrooms, cheese cannolis, and fig perdu. 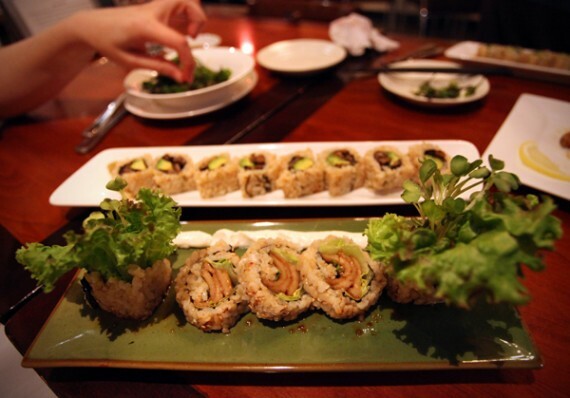 read all about the new menu here. you won’t wanna miss it. 3.) 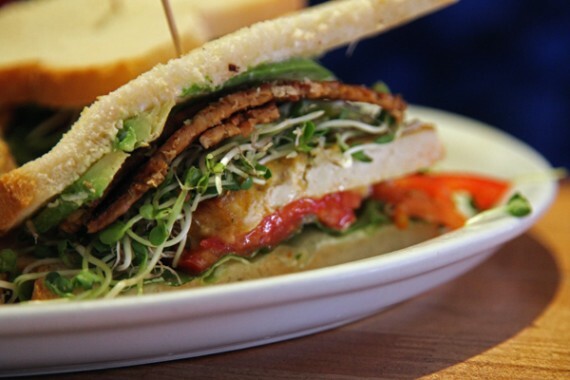 lastly, VOTE FOR MADELEINE BISTRO in the vegnews veggie awards! they were nominated for best restaurant (page 1), and for best chef (page 6). honestly, they deserve it. 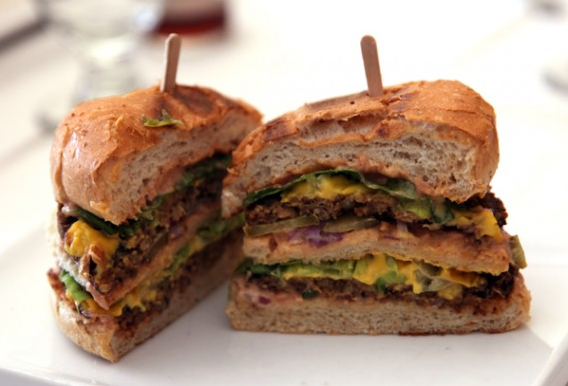 and we deserve to see LA represented FINALLY in the veggie awards. DO IT. also, please vote for quarrygirl in the best blog category! thx. xo. that’s all i got for now. bummer that madeleine is closed for brunch this weekend, but i guess that means i better make it there for dinner. s’mores, anyone?!?! hey everyone, i’m gonna go ahead and spread a HUGE RUMOR here. 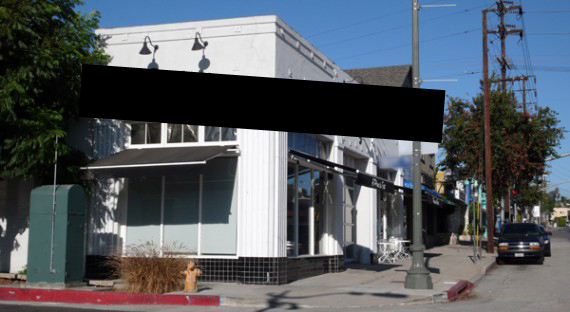 it appears as though madeleine bistro is expanding/moving their main restaurant to eagle rock. 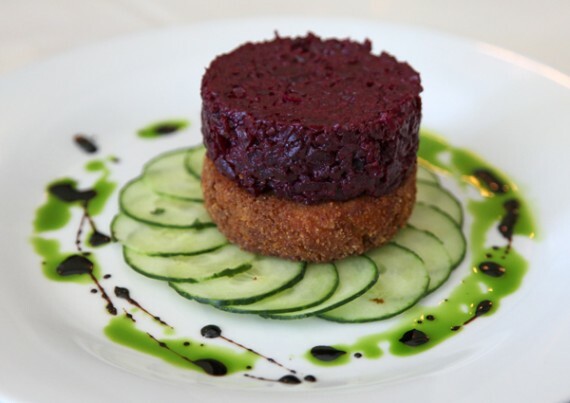 it’s no secret that the vegan fine dining establishment has been looking for a new location for quite some time—the internet is abuzz with rumors that santa monica or hollywood may be madeleine bistro’s new home. well i’m sorry west-siders and tourists, but hipsters can rejoice! 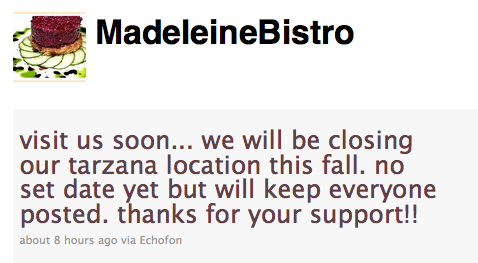 …i have it on pretty good authority that madeleine bistro is moving east. as of now, they are in negotiations with an already vegetarian establishment in eagle rock, and hope to move into their space. the madeleine bistro takeover may start happening as early as next weekend. stay tuned. BTW: if this doesn’t happen, DON’T LOOK AT ME! as i said in the VERY FIRST SENTENCE of this post, THIS IS A RUMOR! believe at your own risk. jeez. if i AM RIGHT, though…you heard it here FIRST, suckaz!